Stop me if youâ€™ve heard this one before. A religious cult declares that Armageddon is coming, and that Satan is sending his demons into an all-or-nothing battle for your soul against Godâ€™s servants. And these wild-eyed fanatics are led by a charismatic preacher whose TV rants are passionate, fiery, and, oh yeah, creepy. And, wouldnâ€™t you know it, not everyone buys into that whole â€œArmageddon is coming, so we have to kill you in order to save you, so just sit still and let me do Godâ€™s workâ€ thing. Thatâ€™s your setup for Maurice Devereauxâ€™s End of the Line, a French Canadian horror film that, despite its campy premise and dialogue, takes elements from The Believers, Night of the Living Dead, Rosemaryâ€™s Baby, and other films, and weaves them into an effectively creepy narrative about the end of days. 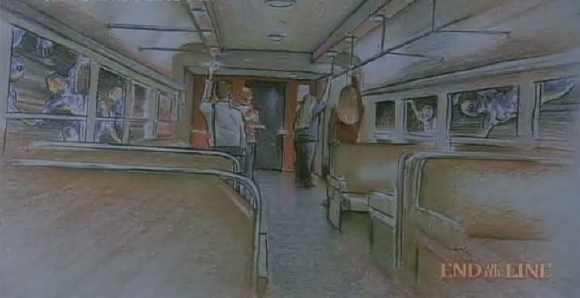 You know somethingâ€™s up from the start, when our young nurse protagonist, Karen (Ilona Elkin), has a creepy premonition involving a subway, a drawing, and a really good opening scare for us. And thatâ€™s not all. We hear on the radio at her mental ward that thereâ€™s a strange rash of suicides and suicide bombings across the country, and that people in her institution are acting particularly nutty. â€œA full moon and an eclipse,â€ a co-worker offers up as the explanation. But alas, as Karen boards the subway for home, sheâ€™s about to find out that itâ€™s a bit more than that. The rest of the film takes place underground, its setting reduced to a stranded subway car and then its maze-like subway tunnels beneath the city. There, Karen begins to hear chilling, ghostly whispers calling her name, and when she sees the bloodied ghost of a former patient whoâ€™s just committed suicide, the dark, claustrophobic confines of the subterranean setting really come into play. Fortunately, she meets a guy, Mike (Nicolas Wright), who comforts her into believing that maybe sheâ€™s just seeing things. Unfortunately, ghostly whispers and apparitions arenâ€™t the only ones down in the tunnel with them. On the same train are a bunch of folks decked out in SS-like uniforms and carrying around what seem to be standard-issue beepers and crucifixes. And when those beepers all start going off at the same time, Armageddon officially kicks off. Turns out these kindly, smiling folks in those militaristic uniforms are members of something called the Voice of Eternal Hope, a religious movement (i.e., cult) that foresees the end of days and has a plan to meet it head on. Armed with crucifix daggers, swords, and an unwavering conviction that they are doing Godâ€™s work, they set out to â€œsaveâ€ (i.e., kill) people. But donâ€™t let that scare you. â€œItâ€™s for your own good,â€ one tells one of his victimsâ€¦I meanâ€¦subjects of salvation. â€œYou must be saved. Iâ€™ve seen all the signs, and now the time of reckoning is upon us all.â€ And so, they go killing off everyone in the subway. Only a handful of young, attractive 20-somethings survive the initial onslaught, escaping into the tunnels and starting a desperate dash to safety. Among the survivors is Karen, Mike, and a girl named Sarah (Nina M. Fillis), who just happens to be a Hope member whoâ€™s suffering a sort of crisis of faith (mostly because she loves her boyfriend, who, you know, isnâ€™t a member). End of the Line, as a narrative, works for several reasons. While its premise is fairly straightforward and hardly original, its execution is effective in heightening the chill factor of its religious cult running amok storyline. On the one hand, the cult members run the gamut of human emotional responsesâ€”sure, youâ€™ve got the over-zealous ones, but you also have the horny one who wants to get laid before he dies, the reluctant, scared ones who canâ€™t bring themselves to â€˜saveâ€™ their victims, and the kindly, matriarchal ones who seem to genuinely love the people they are saving. In other words, this isnâ€™t some monolithic cult whose members are thoroughly brainwashed by a charismatic leader. These are real people whose struggles and crises seem as real and gripping as their convictions. So much so, you actually begin to believe that maybe, just maybe, theyâ€™re not entirely crazy. 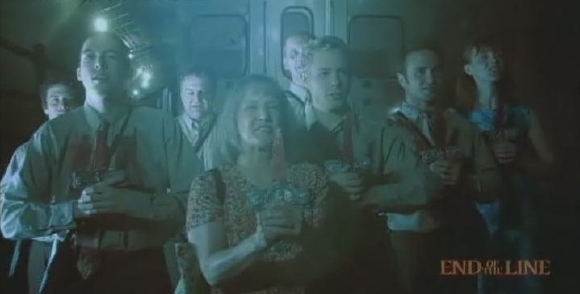 And considering the lack of any real character development among Karen and her fellow survivors, the cult members prove the most interesting characters in the movie. But the film works as a horror movie as well. While occasionally relying on formulaic, something-jumps-out-at-you-suddenly scares, many of its scares are more visceral. When one character, for example, catches a glimpse of something slithering around beneath a grated staircase, you get that â€˜what the HECK was that? !â€™ chill that a good horror film is supposed to give you. And like any good horror film, End of the Line makes non-scary things suddenly scary. Seriously, whatâ€™s so scary about seeing four people standing together, facing away from you at the end of a subway carâ€¦even though theyâ€™re getting closer without really movingâ€¦and even though the picture in your hand, a picture sent to you by a dead woman, depicts that same group of four peopleâ€¦who are just standing thereâ€¦in the flickering lights of the subwayâ€¦justâ€¦waiting? The movie takes simple, everyday things (e.g., people standing together, TV monitors, peopleâ€™s faces), and re-invents them into something more insidious and terrifying. End of the Line should be a favorite of gore hounds as well. Thatâ€™s right, ladies and gentlemen, while the movie isnâ€™t a bloodbath, its few gore scenes will make you squirm. A couple of its death sequences are amazing in that the camera doesnâ€™t cut away when you expect it to (like when this guy is being half-decapitatedâ€¦thatâ€™s right, half-decapitated, because sometimes a sword isnâ€™t going to be sharp enough to cut through a human headâ€¦ouch). And thereâ€™s a genuinely nasty, disturbing sequence of images involving a fallen Hope member, his wife, and their unborn child. Like anything else, End of the Line isnâ€™t perfect. Though the acting is good across the board, and although most of the main Hope members are sufficiently fleshed out as characters, alas, Karen and company arenâ€™t. We donâ€™t know much about them, so weâ€™re less inclined to care about their desperate attempt to escape. What really bogs them down, though, is some occasionally corny dialogue. When Mike tells Karen that he has a â€˜creep-o-meterâ€™ that lets him read people, and when he keeps harping on about his creep-o-meter, you just want him to shut up and stop embarrassing himself. In one tense scene, as the group is ready to move out of their temporary refuge and back into the tunnels for their final dash toward the surface, one of the characters makes this interesting proclamation: â€œIf anyone has to go to the bathroom, now is the time. I donâ€™t know about anyone else, but I have to take a dump.â€ Okaaaay. Nice way of keeping the tension of the scene intact with some really silly dialogue. And no, it doesnâ€™t quite work as a comedic release, either. I think this is the biggest problem with the film, and why it might ultimately be unable to overcome its camp status. The characters seem to talk a lot of movie-speak (i.e., saying the kind of things no one in real life or in that situation would actually say), which leads to some amusing zingers, but that likewise dilutes the tension of the filmâ€™s narrative. Had the dialogue been a bit more natural and less campy, the film might have graduated to that next level of horror movie brilliance. But maybe Iâ€™m being nitpicky. Because this film was genuinely entertaining, its storyline compelling, its take on fanaticism suitably confounded, its creepiness and shocks smartly employed, its ending brilliant in its unexpected ambiguity. And so, even though itâ€™s clearly got its campy elements, End of the Line is superior camp. Not an A-movie, but not a B-movie; kind of like a high B+/low A- movie.